19, September 2016: Electric transportation industry are soaring as the world’s business giants are joining the hunt to build electric transportation devices. Airwheel, an established manufacturer in electric commuting devices have already grabbed a site of the market. The world’s leading smart phone producers, searching giant and even internet video producers are all in the hunt to build electric cars. It is obvious how hot the electric transportation industry is. Luckily, Airwheel, a transportation solution provider, has already grabbed a small bite of the market. The future prospect of electric transportation devices is immeasurable. The governments are committed to boost the development of new energy vehicles in the next decade, in a bid to save the worsening environment and strengthen market competitiveness. In this way, Airwheel has made the running. The previous electric scooters have enjoyed worldwide popularity. In this year, two types of folding electric bike are unveiled to further cement its market standing. The dominant advantage of Airwheel e bikes lies in its portability and intelligence. Airwheel e bikes don’t simply equal to bikes powered by batteries. The high tech contents enable it to be more competitive in the market. Airwheel E6 foldable electric bike, for example, has adopted light-weighted aluminum alloy materials and patented body design. The multi-foldable system also made it easy to fold. These features combined make it easily to be carried around. E6 is coupled with car-level Li-ion battery set, which generates sufficient power. Airwheel backpack e bike E3, is even an extreme combination of structure and materials. E3 weighs only 12.5 kg, with the battery weighing 1.4kg. It is able to carry a maximum weight of 100kg. Airwheel e bikes can be connected to phones via a customized app. The app provides many practical functions like fault self-diagnosis and speed setting. They are designed to be easily operated by all kinds of people. 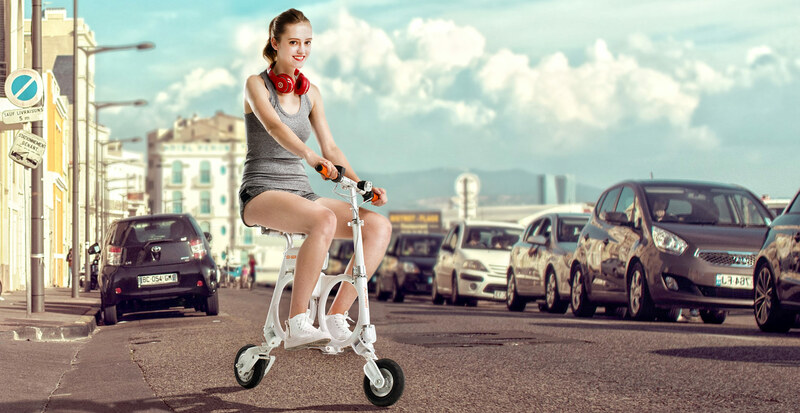 Airwheel e bikes can be widely applied to daily commuting and travelling. With small size and light weight, they can be connected to public transportation, like trains, metros and buses. They can also be stored in offices and car trunks. The hot demand in the electric transportation industry has hastened the invention of efficient devices like Airwheel intelligent e bikes. In return, these products make daily commuting much easier and comfortable.